First of all, let me just say how fun and sweet Avery has been lately. Craig and I have been talking about what a joy she has been lately...just hugging and kissing us and being so funny and entertaining! Well, yesterday I ran to Kohl's for about an hour, and I came home to the funniest thing ever. 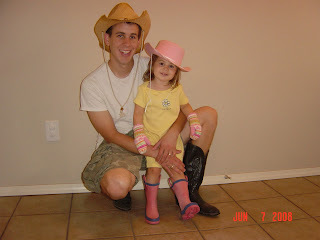 Craig and Avery both had on boots and cowboy hats (and shorts!) and Craig said Avery made him dress up! What a great dad!! 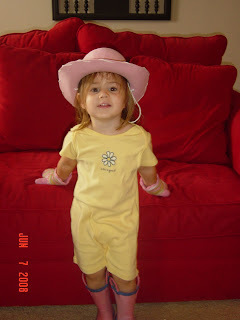 Avery loves her rain boots, so she had put them on with her cowgirl hat, then said "put on your boots, Daddy." He tried to say he didn't have any, but she said, "yes, in your closet, I'll show you." And she proceeded to show him the boots he bought at Goodwill for her birthday party this year. So he had to put them on. Then she said "put your hat on Daddy." He again tried to say he didn't have one, and she pointed up to my cowboy hat I bought for the party, and said, "right there, Daddy. Put it on!!" So he had no choice but to oblige, and Dress Up Day with Daddy begun. Later, Avery insisted on putting on her mittens and winter hat as well, and so she switched between all of her hats all day long. 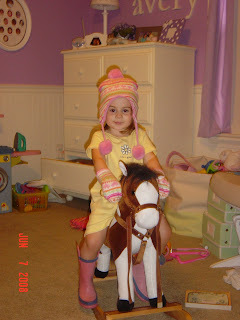 I especially love the winter hat, mittens, and rain boots on her rocking horse. What fun she is! And what a great Daddy she has. How many dads would dress up and play with their daughter on their Saturday afternoon? I hope Avery realizes how blessed she is with her Daddy! Lovin' the boots, Craig. Ha ha. I know Justin will get a kick out of seeing you all gussied up like that. I think that there are more than a handful of dads who would play dress up with their daughter. But one who's brave enough to take a picture of it AND let mommy post it in the net, now that is a different story. I'm just waiting for when Avery discovers how pretty Daddy will look in make-up!! !